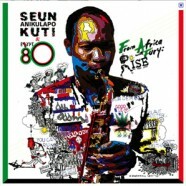 John co-produced and mixed the new Seun Kuti album at his CLEAR Studio with Brian Eno. The Guardian **** Seun Kuti has always had two problems. He has had to battle against continual comparisons with his legendary father Fela (hardly surprising, since he based his early career on a stage performance in which he looked and sounded like his late dad’s clone), and he has had to watch the success of Fela’s oldest son, Femi. The UK has been blitzed with Fela nostalgia in recent months, with the success of the Fela! stage show and the rerelease of all his back catalogue. Now it’s Seun’s turn to show whether he can take Afrobeat to a new level. He succeeds – but with a lot of help from others. For a start, there’s his band, which includes legendary Nigerians such as band leader and keyboard player Lekan Animashaun, who played with Fela. And there’s the production team of John Reynolds and Brian Eno, who have updated the style with a new edge and attack, and the occasional hint of electronica. This is an album that’s memorable for its slick, rousing instrumental work, which includes Seun’s own saxophone contributions. His new songs attack predictable targets, but at least he is beginning to find his own voice.